By the command of Shree Ishwar Bapa, Jeevanpran Swamibapa toured throughout Gujarat to keep the disciples of the Satsang Mahasabha loyal and adherent to the faith. On one occasion, Jeevanpran Swamibapa was in Ahmedabad. Swamibapa wanted to see the progress of Maninagar Temple's construction. He travelled by foot from Saraspur towards Maninagar. Up to Raipur Gate and Kamnath Mahadev there were no problems as it was light. However, by the time Swamibapa reached Kankaria Lake, it had become dark and there was no street lighting. Swamibapa walked along the bank of Kankaria Lake trying to find the road that led to Maninagar. Swamibapa walked around the lake 3 times. Eventually, he picked one road and took the chance. Indeed, it was the correct road to Maninagar. Jeevanpran Swamibapa reached the main gate of the land of Maninagar Temple. There was a small wooden door, through which Swamibapa entered the grounds. At the middle of the land was a small bungalow-type of building. This was to be the Temple. All around, there were mango trees. The floor was laden with fallen mango tree leaves. As Swamibapa walked over the dry leaves, they crackled. It was if they were all applauding his arrival. There was a narrow platform at the exact site that Shree Hanumanji gives darshan today. Swamibapa dusted it with a cloth and rested there for the night. This was Swamibapa's first night in Maninagar. The next morning, Jeevanpran Swamibapa inspected the building work and then continued his tour of Gujarat. Shree Ishwar Bapa had entrusted the responsibility of Kadi Temple to Jeevanpran Swamibapa and so he mostly stayed there. However, after Shree Ishwar Bapa withdrew his human darshan, Jeevanpran Swamibapa decided that it was time to develop the site at Maninagar; the foundation stone of which had been laid by Shree Ishwar Bapa - the site which Shree Ishwar Bapa had entrusted to him. On Samvat 1999 Shravan vad 4, Jeevanpran Swamibapa left Kadi with one sant. They arrived at Ahmedabad Station after sunset. By foot, they reached Maninagar. Swamibapa cleaned one room and placed Shree Harikrishna Maharaj on a platform. As they had come by bus, they had to fast, so their food was not an issue. However, they did not have anything to offer Shree Harikrishna Maharaj. They had no milk or fruit. All that they could offer the Lord was water. In the morning, when it was light, Jeevanpran Swamibapa looked around the grounds. There were 3 long rooms. All were completely empty except for one room, in the corner of which was a sack of coal. Beside it, was an empty kerosene tin. Swamibapa laughed, "This will be our saucepan!" Swamibapa looked around for something to cut the tin. Eventually, he found a rusty chunk of metal, which he used to cut open the tin. A sant went to take coal from the sack. As he opened the sack, a line of scorpions emerged from it and fell to the floor. The scorpions did not sting the sant, but instead walked away in a straight line. Jeevanpran Swamibapa said, "These are not ordinary scorpions. They represent the abundant, overflowing wealth that will arise from here." 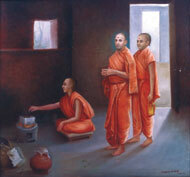 Jeevanpran Swamibapa started chanting the Swaminarayan name. One by one, the scorpions magically disappeared. Jeevanpran Swamibapa sent for a murti of Shree Sahajanand Swami Maharaj from the home of Shree Chandrasankarbhai and a murti of Shree Abji Bapashree from the home of Shree Baldevbhai. Raw khichdi (lentils) was also sent from Chandrasankarbhai's home. Swamibapa washed the lentils in a piece of cloth and cooked it in the kerosene tin. There were no passageways between the three rooms, but instead, there were deep ditches. Several steps had to be climbed in order to reach each room. 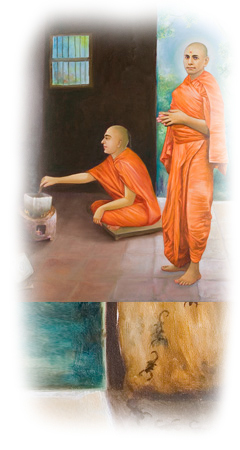 Swamibapa chose one room for installing the murtis and thoroughly cleaned and washed it. He then installed the 2 murtis. In reality, today was the day of the murti pratishtha, and a grand ankut should be offered to the Lord. However, all that Swamibapa could offer the Lord was plain khichdi. He did not even have any ghee to add to the khichdi. Even if he had some ghee, there was no point. It would only have run through the patravala (plate made of leaves). Swamibapa did not even have a plate on which to serve the khichdi to the Lord. There was no spoon to take the khichdi out of the tin and place it on the patravala. Swamibapa formed a cone using a patravala, and scooped out some khichdi. Jeevanpran Swamibapa offered this khichdi to the Lord. Whatever the Lord consumes, He does so, not looking at the food, but acknowledging the love and devotion of the individual who makes the offering. Still, as Swamibapa offered the khichdi to the Lord, he felt ashamed to give such a lowly offering on such a special occasion. Just then, a voice was heard. Shree Ghanshyam Maharaj spoke and said to Swamibapa, "Look up! Do not feel shame. Due to your love for Me, I have accepted your offering. Now you eat the prasad. I have made it prasad. It now contains all the divine tastes. No other offering could have been more special than this. Do not be sad. I am extremely pleased with you." Jeevanpran Swamibapa opened his eyes. A divine light emerged from the murtis. These 2 murtis, are the very same murtis that give darshan today in the main Mandir, behind Shree Sahajanand Swami Maharaj. By the end of the day, news of Jeevanpran Swamibapa's arrival in Maninagar spread throughout Ahmedabad. Everyone came to know that the supreme murtis of Lord Swaminarayan and Jeevanpran Bapashree had been installed in Maninagar Temple. Many sankhya yogi ladies lived in the Vahelal district of Ahmedabad. They had remained faithful to the Satsang Mahasabha and Jeevanpran Bapashree. Consequently, they were thrown out of Kalupur, Ahmedabad Temple . Their poojas and clothes were tossed out of the windows and they were left on the streets, without anywhere to go. Shree Chaturbhai took them to his empty bungalow in Vahelal and allowed them to live there. Amongst these sankhya yogi ladies were Baashree Mongibaa, Chancharbaa, Jivkorbaa, Mahalaxmibaa, Lalitabaa and Balubaa. These sankhya yogi ladies heard that Jeevanpran Swami made the first thaar of khichdi in an old kerosene tin. They became extremely upset by this. "The protector of the divine Karan Satsang has to endure so much hardship!" The sankhya yogi ladies gathered all the required utensils and raw food, and filled a cart. This was then sent to Maninagar. Every few days, they sent someone to see what Jeevanpran Swamibapa required. The person always returned saying, "Swamibapa says he does not need anything." The sankhya yogi ladies said, "Swamibapa is a pure ascetic. He will never ask for anything. You must go and look around. Find out for yourself what is running out and come back and tell us." These sankha yogi ladies had a deep respect for Jeevanpran Swamibapa, because by the grace of the supreme Lord, they had recognised who he was.